Blass, F. and A. Debrunner. A Greek Grammar of the New Testament and Other Early Christian Literature. A Translation and Revision of the ninth-tenth German edition incorporating supplementary notes of A. Debrunner by Robert W. Funk. Chicago: Univ. of Chicago Press, 1961. Bock, Darrell and Buist Fanning, eds. Interpreting the New Testament Text. Wheaton, IL: Crossway, 2006. Campbell, Constantine R. Campbell. Basics of Verbal Aspect in Biblical Greek. Grand Rapids: Zondervan, 2008. _____. 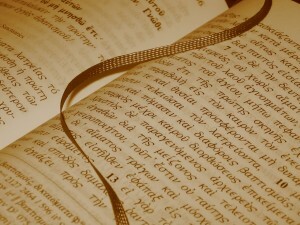 Verbal Aspect and Non-Indicative Verbs: Further Soundings in the Greek of the New Testament. Studies in Biblical Greek 13. New York: Peter Lang, 2008. _____. Verbal Aspect, the Indicative Mood, and Narrative: Soundings in the Greek of the New Testament. Studies in Biblical Greek 14. New York: Peter Lang, 2007. Decker, Rodney J. Temporal Deixis of the Greek Verb in the Gospel of Mark with Reference to Verbal Aspect. Studies in Biblical Greek 10. New York: Peter Lang, 2001. Evan, T. V. Verbal Syntax in the Greek Pentateuch: Natural Greek Usage and Hebrew Interference. Oxford: Oxford Univ. Press, 2001. Olsen, Mari Broman. A Semantic and Pragmatic Model of Lexical and Grammatical Aspect. Outstanding Dissertations in Linguistics. New York: Garland, 1997. Porter, Stanley. Verbal Aspect in the Greek of the New Testament with reference to Tense and Mood, 2d ed. Studies in Biblical Greek 1. New York: P. Lang, 1993. So, uhm, what’s this list for…? It’s part of a Greek grammar seminar with lots of reading.